Even though Greek politicians have had much more to worry about in recent years than a naming contest with a small, neighboring country of just 2.06 million people, the battle lines between Macedonia and Greece have become tighter as ever following the election of Nikola Gruevski (pictured above) in 2006 on a center-right, nationalist platform that’s exacerbated the world’s silliest international dispute after Greece actively vetoed Macedonian accession to NATO in 2008. But the issue has plagued the modern Republic of Macedonia since the breakup of Yugoslavia. While Slovenia and Croatia joined the United Nations in May 1992, it took Macedonia 11 more months because of Greece’s objections to its use of ‘Macedonia.’ The end result was a ‘temporary’ solution, whereby the UN recognized ‘The former Yugoslav Republic of Macedonia.’ Today, more than 20 years later, you’ll find that Macedonia is still listed under ‘T’ (for ‘The’), not under M (for ‘Macedonia’) in official UN documents. Gruevski’s party, the VMRO-DPMNE (Внатрешна македонска револуционерна организација – Демократска партија за македонско национално единство; Internal Macedonian Revolutionary Organization – Democratic Party for Macedonian National Unity), has held onto power for the past eight years in part by effectively stoking the Macedonian nationalism issue. A major factor in Gruevski’s agenda is the large-scale revitalization effort in Skopje, the Macedonian capital, that has remade the urban landscape. 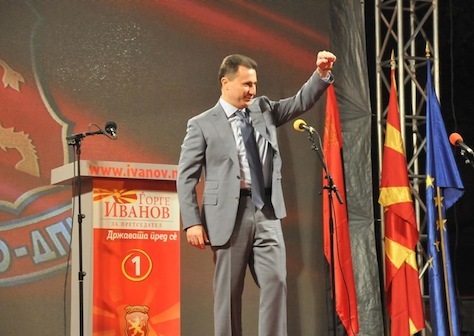 But as part of the ‘Skopje 2014’ effort, Gruevski hasn’t been shy about poking his finger at his Greek neighbors. In 2011, he commissioned an 11-foot high statue of Alexander the Great in Skopje, for example. 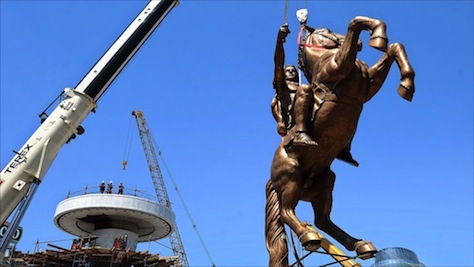 Officially, the statute is entitled, ‘Warrior on a Horse,’ though that hardly makes it less of a nuisance to Athens. Ostensibly, the Skopje 2014 effort is designed to rebuild a capital that was largely destroyed by a devastating 1963 earthquake that leveled 80% of the city. Nonetheless, it has become a flash point in what Greece sees as Macedonian overreach — and, possibly, Macedonian irredentism. Gruevski’s antagonistic ‘antiquisation’ campaign has embraced parts of ancient Greek heritage as Macedonia’s own — Alexander the Great and Philip II of Macedon have popped up not only as shiny new statues but as the names of airports (Skopje’s international airport is now ‘Alexander the Great Airport’), train depots and stadiums across Macedonia. Though it’s an amusing sideshow, plenty of Macedonians oppose the gauche building spree, decrying the ‘Disney-fication’ of their capital. That’s especially true among the 25% of the population that’s ethnically Albanian, speaks Albanian instead of Macedonian and practices Islam instead of Orthodox Christianity. Though Albanians largely live peacefully with its ethnic Macedonians, they are clustered in the country’s northwestern corner, and participated in armed struggle against the state as recently as 2001 for greater minority rights. Even many ethnic Macedonians, including the leaders of the opposition Social Democratic Union of Macedonia (SDSM, Социјалдемократски сојуз на Македонија) worry that the Skopje effort is a waste of the government’s energy at a time when the economy is still struggling. Gruevski and the ruling VMRO-DPMNE point to the fact that unemployment has fallen from around 40% to around 30%, but the SDSM instead points to the fact that most of the country’s new jobs have been created by the state, not through organic economic growth. Even worse, the ruling party hasn’t been above using its role in the economy to coerce the votes of fearful workers in its bloated civil service. The reason for this month’s parliamentary elections is even more obscure. When the ruling VMRO-DPMNE decided to support incumbent Gjorge Ivanov for reelection as Macedonia’s largely ceremonial president, its junior ally in government, the Democratic Union for Integration (DUI, Bashkimi Demokratik për Integrim), one of two parties that work for the interests of ethnic Albanians, pulled out of the governing coalition in protest and recommended that its supporters boycott the presidential election altogether. Nonetheless, Ivanov led the first round of the Macedonian presidential election after voting on Sunday, with 51.65% of the vote, largely outpolling the SDSM’s Stevo Pendarovski, who had 37.56% of the vote. Iljaz Halimi, the candidate of the other ethnic Albanian party, the Democratic Party of Albanians (DPA, Partia Demokratike Shqiptare), won just 4.49%. Though Ivanov won a majority of the vote in the April 13 round, the reduced turnout means that Ivanov will still face a runoff against Pendarovski on April 27, when Macedonians will also elect all 123 members of the Собрание (Sobranie), the country’s unicameral assembly. Though the two major ethnic Albanian parties have been split over the government in the past, most ethnic Albanians boycotted the first round of the presidential vote, even though the DUI’s leaders are just as wary of Pendarovski as of Ivanov. Albanians will almost certainly vote in greater numbers on April 27, when the DUI’s representation in the national assembly will be at stake. Theoretically, that means the presidential race could tighten. The results of the April 27 round will almost certainly boost the ruling VMRO-DPMNE, which seems certain to return to power, in coalition with either Albanian party, the DUI or the DPA, both of which have allied with it in the past. The VMRO-DPMNE enters elections with 56 seats in the Sobranie, while the SDSM holds 42 seats — in the most recent 2011 election, the SDSM made significant gains from the 2008 election that left it with just 27 seats. Even if it consolidates its power, at the expense of an already weak opposition, will the main governing party change its behaviour to enable the country to move forward? Will it adopt a more consensus-driven approach to prevent the country from sinking further into instability? The evidence from previous elections since 2006 do not give much cause for hope in this respect. However, despite appearances to the contrary, the country has lost much practical support internationally because of the government’s authoritarian and ethno-nationalist based policies. This may give the incoming government pause for thought. There is no doubt that the prospect of EU accession has had a major impact in promoting much-needed reforms and building stable institutions in the countries of the former Yugoslavia. Yet, as reflected in all the internationally recognised indicators, such as those issued by Freedom House, Transparency International or Reporters without Borders, the goal of achieving effective democracy throughout the region remains very much a ‘work in progress’. This post has been amended to note the Albanian boycott of the first-round presidential race. Kevin, how is the Macedonian economy “lackluster” ???? A 20% decline in the unemployment rate and an economy that grew from $5.9 bln to $9.6 bln in GDP since 2006. DURING A GLOBAL RECESSION IS IMPRESSIVE! Macedonia’s GDP grew 2.9% in 2011 and contracted by 0.3% in 2012. Its GDP per capita on a nominal basis is somewhere between that of Ukraine and Belarus; on a PPP level, it’s close to Serbia’s. That’s lackluster — it may be slightly better than average by European standards, or even by Balkan standards, perhaps, but not by the standards of an emerging economy. I would argue that Turkey is a better benchmark for Macedonian growth prospects than France or Italy. Meanwhile, public debt is creeping up, and Macedonia had a budget deficit of over 4% in 2013, much of the ‘job creation’ comes from the state sector, which makes the unemployment drop less impressive. That drop, by the way, was from 38% to 29%, and even at the lower level, Macedonian unemployment is considered crisis-level in neighboring Greece. I haven’t seen youth unemployment numbers, but I’m sure they’re also horrible. There are reasons for hope, too, of course. Macedonia’s state isn’t a tripartite mess of corruption within a dual-entity structure, à la Bosnia and Herzegovina. And growth is projected for around 3% in 2014, and that’s not bad. But I would argue that the data demonstrate that Macedonia’s performance is well below optimal. On a relative basis you can point to countries where MKD doesn’t look as good, but I can also cherry pick countries that look worse than MKD. On an absolute basis you can’t deny that MKD’s economy has grown and unemployment has decreased since 2006. Considering it’s major trading partners went through a heavy recession (GR still is) those are remarkable accomplishments. Furthermore MKD barely received any investments during Yugoslavia, suffered from a illegal embargo by Greece, survived a civil war, and currently being blackmailed by “friendly” neighbors in it’s efforts to join NATO & the EU. Those are high hurdles for any country to pass. Lastly I underestimated the decrease in unemployment. It’s a 23% drop (38 – 29 / 29) in unemployment. I’m sure some of those hires were forced by the Western imposed Ohrid Framework. Nonetheless I’m sure those people are happy to work and provide for their families.